Murder almost certainly increased substantially in the U.S. in 2016, one year after it rose at its fastest pace in a quarter century. Using a combination of official police data and local media reports, I was able to collect murder counts through at least November 2016 for 73 of the 83 U.S. cities with populations above 250,000, and partial data for all but one of the rest.2 The counts are preliminary and could be subject to change before they are submitted to the FBI for inclusion in the Uniform Crime Report that will be published in September. This year’s rise appears slightly smaller than last year’s dramatic increase. The big cities experienced roughly a 11.3 percent increase in murder in 2016, which is down from the same group’s 14.8 percent increase from 2014 to 2015. Still, the figures suggest that big cities have seen murder rise by more than a quarter in just two years, likely the biggest two-year increase since 1989 to 1991. The issue has drawn national attention, with Donald Trump repeatedly pointing to violence in cities as evidence of a breakdown in law and order under President Obama. Even after the recent increase, however, the murder rate remains low by historical standards. A few points jump out while reviewing the change in murder in big cities in 2016. Chicago has gotten the headlines, and the Windy City’s 59 percent increase in murder accounted for fully 40 percent of the rise in murder among big cities. But Chicago was not the only big city to experience an alarming jump in murders in 2016. In all there were six big cities — Louisville, Kentucky; Memphis, Tennessee; Anchorage, Alaska; Fort Wayne, Indiana; Durham, North Carolina; and Indianapolis — that appear to have set records for highest murder counts in one year dating back to 1960.3 There were also at least 16 big cities that tied or surpassed their worst murder years since the start of 2000 in 2016. My early October update pointed to murder being up 10.5 percent at that time relative to the same point in 2015. Many cities saw murder pick up over the last few months of the year, including Chicago, increasing from +41.8 percent at the end of September to +59.4 percent at the end of the year. Murder increased by 15 percent or more relative to YTD 2015 in seven cities with high murder tallies4 over the last few months of 2016 while murder slowed by 15 percent or more in only one such city (Phoenix) over that span. Estimates for 2016 are based on latest available data. What to do about Orlando? Orlando’s murder total is complicated because of the 49 people who were killed in the Pulse nightclub attack there in June. Counting those deaths, the city saw a 169 percent increase in murder in 2016 — from 32 murders in 2015 to 86 in 2016. Without them, Orlando saw a much more modest 16 percent increase, to 37 murders. The attack also makes a meaningful difference in the broader nationwide increase: Including the Pulse killings would boost the big-city murder count by nearly a percentage point. The Orlando Police Department has decided not to count the Pulse victims in the murder statistics it reports to the FBI, so I have not included them in my count, either. There is precedent for that decision: Deaths from the Sept. 11 attacks were not counted by the FBI for UCR purposes, though the FBI included a special section on the attacks in that year’s UCR publication. Conversely, the victims of the 1995 bombing of the Alfred P. Murrah Federal Building in Oklahoma City were included in the FBI’s 1995 UCR publication. The 2016 murder capital of the U.S.
St. Louis likely remained the national murder capital of the United States based on murder rate, with nearly 60 murders per 100,000 residents. St. Louis has had the country’s highest murder rate each year since 2014. Baltimore likely had the country’s second-highest murder rate for the second-consecutive year with roughly 52 murders per 100,000 residents, with Detroit, New Orleans and Cleveland probably rounding out the top five. The table below shows the top 10 big cities in terms of estimated murder rate calculated using the FBI’s 2015 population totals for each city. This kind of cross-city comparison can be tricky, however, because cities draw their borders differently: St. Louis and Baltimore, for example, include only a relatively small geographic area around their downtowns, while cities such as Phoenix and Los Angeles include large suburban areas within their borders. Rates are estimates based on latest available data. Chicago made national headlines this year by eclipsing 750 murders for the first time since the 1990s. Chicago had the most murders of any U.S. city in 2016, but the city’s murder rate of roughly 28 per 100,000 residents likely “only” ranked 8th. Chicago’s rate jumped by about 10 murders per 100,000 people between 2015 and 2016, so Chicago joined Memphis as the only cities with a double-digit increase in murder rate in 2016. If past patterns hold, the 11 percent increase in big-city murders implies that total murders likely rose about 8 percent nationwide in 2016. That would correspond to a national murder rate at roughly 5.3 per 100,000. That would represent a meaningful increase from 2014, when the murder rate fell to 4.4, but it’s about the same as the 5.4 rate when Obama was elected in 2008. 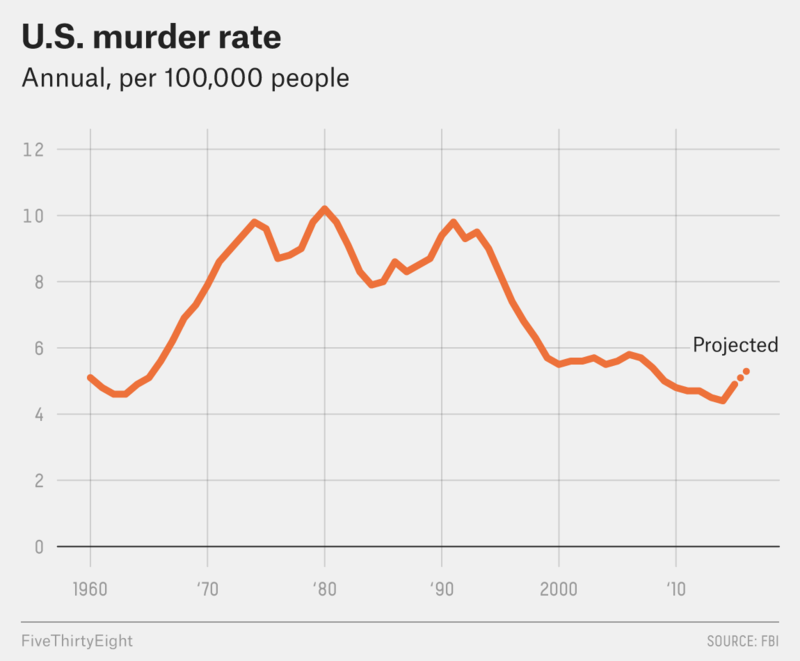 And murder is still down dramatically from the 1980s and 1990s, when the rate topped 9 per 100,000 in many years. A second consecutive increase in murder among big cities, however, suggests that a worrisome long- term trend requiring research and abatement might be developing. Big cities tend to correlate strongly with but also overestimate national murder trends. In 2015, for example, murder rose nearly 15 percent in cities of 250,000 or more, versus 10.8 percent nationally. I was able to collect data through at least August for 78 of the 83 cities. St. Paul, Minnesota, is the only big city for which no 2016 data was available. In all cases, increases in murder totals compare the latest data available from 2016 to the same period in 2015. Because of population growth, record murder counts don’t necessarily imply record murder rates. Defined here as those cities with over 50 murders in 2016.